Irish Marine Artist: Biography, Paintings. Born in Glenariff, County Antrim, the son of a captain in the Coast Guard, Coulter's childhood around the harbours and coastline, together with his natural gift for drawing and painting, enabled him to observe and sketch all the details of anchored ships. At the age of 13, he went to sea for seven years, adding further to his knowledge of marine life and absorbing every detail of the ships on which he sailed. During his youth and his time at sea, he may have encountered works by pier-head artists painting in the Belfast docks, such as Joseph Semple and William McIlveny. In addition, as a seaman during the 1860s, Coulter would almost certainly have visited Liverpool, the big maritime centre, with its thriving school of marine painters. 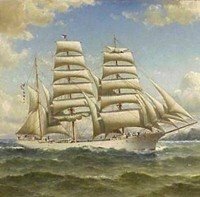 In any event, his oil paintings gradually became known among shipping staff throughout the world, for their accuracy in depicting the details of ships as well as the sea conditions that prevailed. He stands at the head of a list of outstanding Irish marine painters, that includes George Mounsey Atkinson (1806-1884), Richard Brydges Beechey HRHA (18081895), and Edwin Hayes RHA (1820-1904). The Bark Kaiulani Off Point Bonita. by Coulter during his 60 year career. In 1869, while in San Francisco, he had to quit his maritime career due to a leg injury, and began painting more seriously. By 1874 he was a regular exhibitor with the San Francisco Art Association and, despite being self-taught, was already a recognized marine artist in the city. From 1876 to 1878, he spent two years studying marine art in various European cities: in Paris, under Francois Musin, and in Copenhagen under Vilhelm Melbye and Jacob Jacobsen, as well as Antwerp, Brussels and London. Returning to spend most of the 1880s in San Francisco, save for occasional journeys to Hawaii and elsewhere, he moved to Sausalito in about 1890, settling in a house on the waterfront. Unlike many other West Coast seascape artists of the period, who would add the occasional impression of a sailing ship to lend favour to their work, Coulter's paintings are specific portraits of recognizable vessels, enriched with details of every mast and rigging line, together with the functional aspects of the ship's form and construction. In fact, during the 19th century only two other West Coast maritime artists of any note emerged: Gideon Jacques Denny and Joseph Lee, neither of whom matched Coulter's knowledge and appreciation of seafaring matters. A prolific artist, he showed his works regularly, and was included in the "Best of Californian Art" Exhibition (1893) at the World's Columbian Exposition in Chicago. From 1896 to 1906 he joined the staff of the San Francisco Call as their waterfront artist, producing photographic-quality pen-and-ink drawings of vessels or maritime news events until the earthquake disaster of 1906. Ironically, while the earthquake and ensuing fire effectively made him redundant as a harbour artist, it gave him the opportunity to achieve immortality with what is still considered his most significant historical work: his eye-witness painting of the destruction of the Call building, along with much of downtown San Francisco, from a vantage point near the citys waterfront. This event ended his career as a waterfront reporter and at the same time Painted on a 5-foot by 10 foot window shade he rescued from a smouldering building, the work is considered to be the most accurate on-site, portrayal of Californias most famous disaster. During the reconstruction of the city, he received an important commission (1909-20) to paint five 16 ft x 18 ft mural panels for the Assembly Room of the Merchants Exchange Building - the center of all the maritime business on the West Coast. In 1923, one of his panels was reprinted on a commemorative 20-cent stamp. Apart from a year-long trip to Ireland, at the age of 80, Coulter continued to work in Sausalito until his death in 1936. At the age of 85, he held his final show, presenting 75 marine canvases, all painted during his 80s! As an artist, blessed with outstanding skills as a maritime draughtsman, Coulter focused almost exclusively on ships, the sea and marine life generally, although he eschewed portraying ships in distress, preferring to depict them in harmony with their surroundings. For over 65 years, (1869-1936) he pictorialized the shipping industry in San Francisco Bay, capturing the full range of square-riggers, hay scows, tug boats, and schooners that sailed in and out of the Golden Gate. As a mark of respect, a wartime "Liberty Ship", launched in 1943 was named SS William A. Coulter. Examples of his work are in the Oakland Museum; Maritime Museum (San Francisco); Commercial Club (San Francisco); United States Merchant Marine Academy (Kings Point, New York); and the Orange County Museum, California.  For more about marine painting, see: Homepage.  For more about Irish-American painters like William Coulter, see: Irish Art Guide.  For a discussion about fine versus visual arts, see: Definition and Meaning of Art.